Product was exactly what we needed, it installed perfectly. Wish the manufacturer made them a little cheaper but this lamps work as expected. I gave it 5 stars, but face it; if you are planning on using the projector for presentations you really need the back up bulb . . . whether you like it or not. However, until the bulb it came with goes out, I won't know if this is easy to replace! Have purchased this replacement bulb a few times for my Optio projector over the years. Fair price, simple installation. My bulbs burn out quickly but I believe it is due to a malfunction in the projector coupled with the power surges we have in Uganda. OEM product and package. Works perfectly. Brighter than the original. Buy once or buy over & over with the aftermarket! My husband bought an off-brand replacement lamp for our Epson projector, but I complained from day one. "The colors are washed out!" "The darks are too dark." I couldn't stand to watch anything on it. Finally, I said, "I'm ordering a real lamp and you're sending that one back! 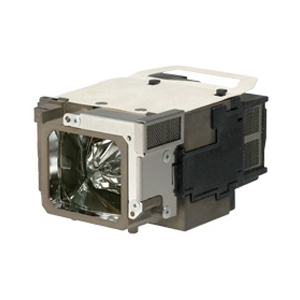 Recently had a lamp go out on Epson 710HD, bought this replacement lamp. Happy with it so far, much brighter than the failing lamp was at the end of its life. Had it a few weeks now, will update if anything unexpected occurs. Best price I could find for OEM lamp. First time I replaced the lamp. Nice and bright, unlike the last one I bought from another vendor. Getting an original product and not a after-market lamp is a big difference.